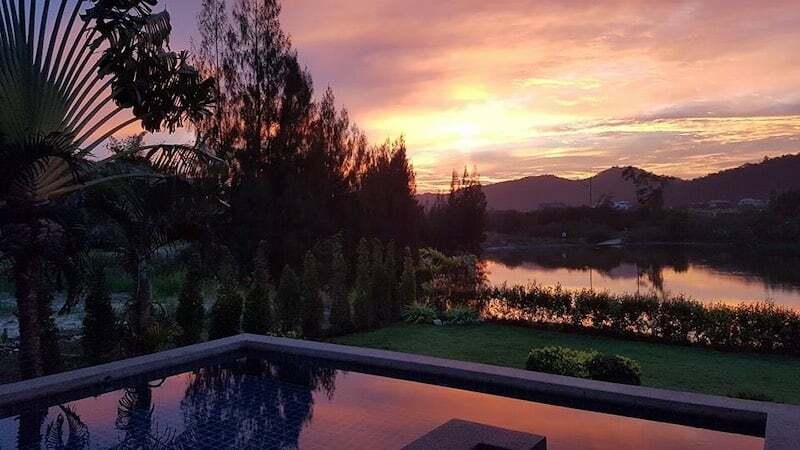 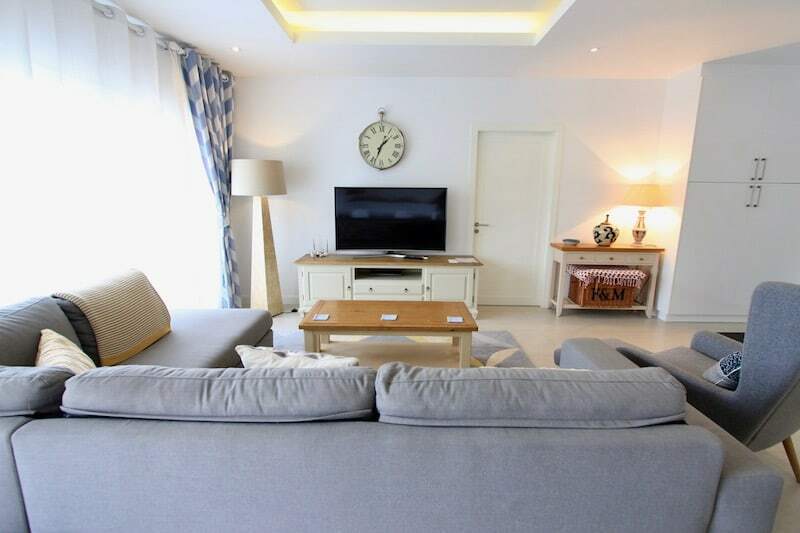 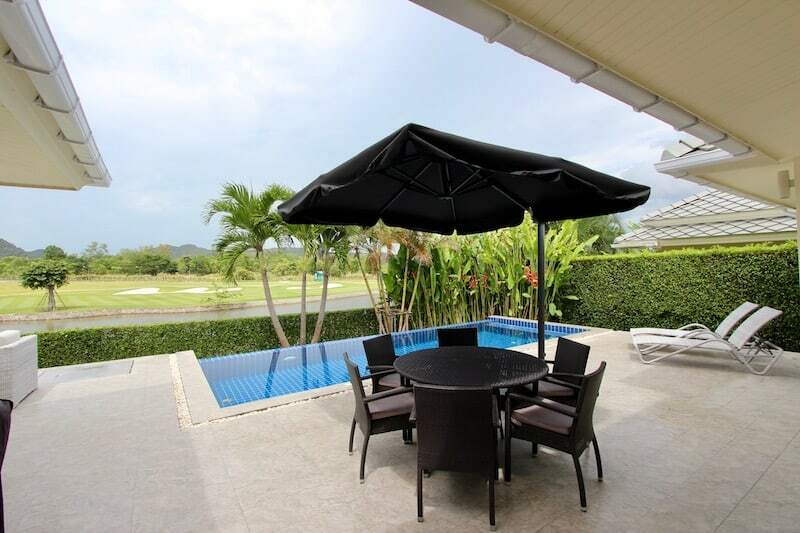 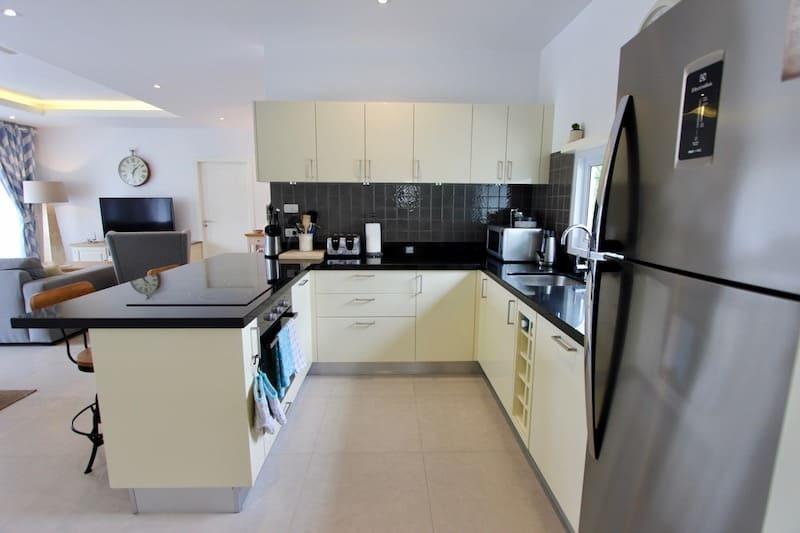 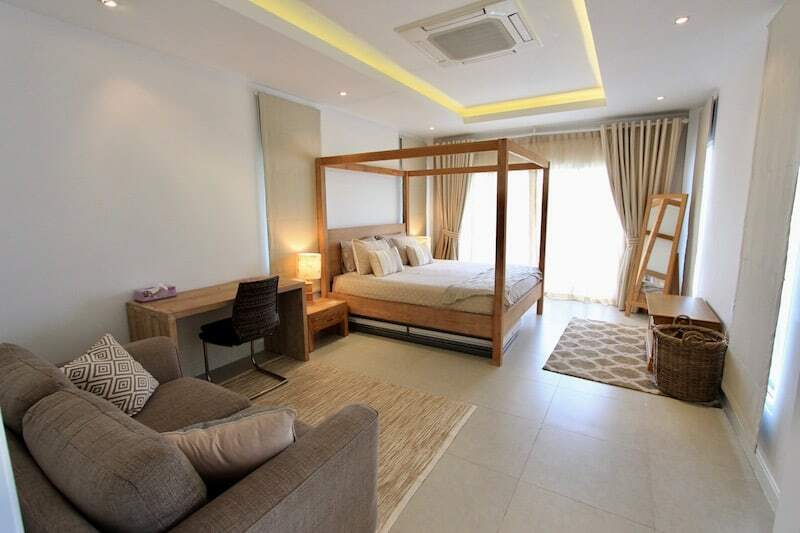 This 3 bedroom, 3 bathroom BLACK MOUNTAIN HUA HIN HOME FOR RENT is within the prestigious Black Mountain golf course, one of the best courses in Hua Hin. 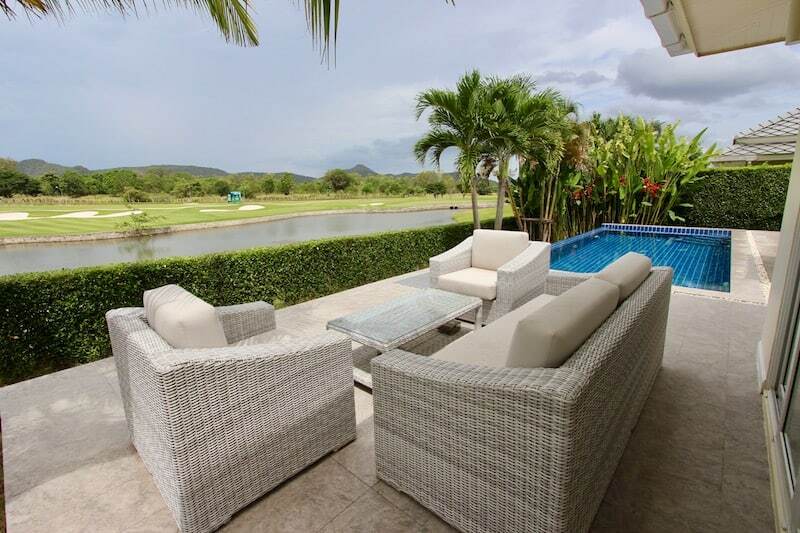 The property enjoys unparalleled views from the terrace of the second tee box on the West Course with a large lake and mountains beyond. 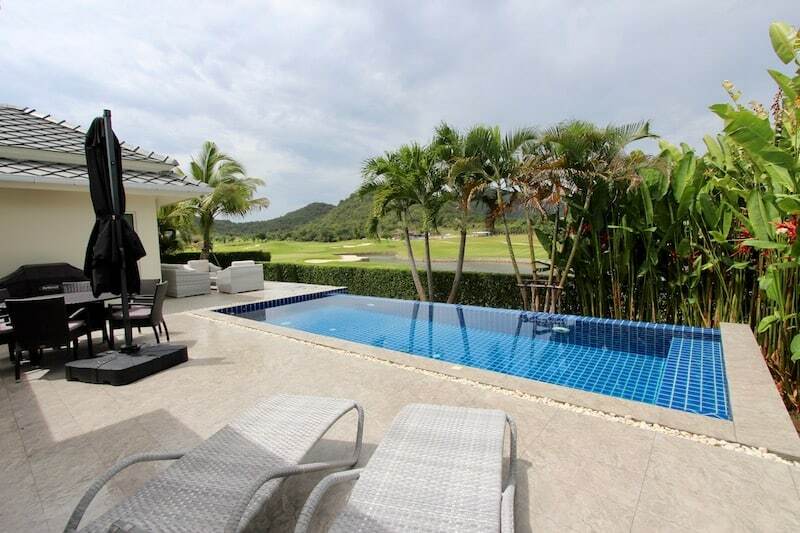 At the front of the property there is also a great view of the fourth tee box and expansive green beyond. 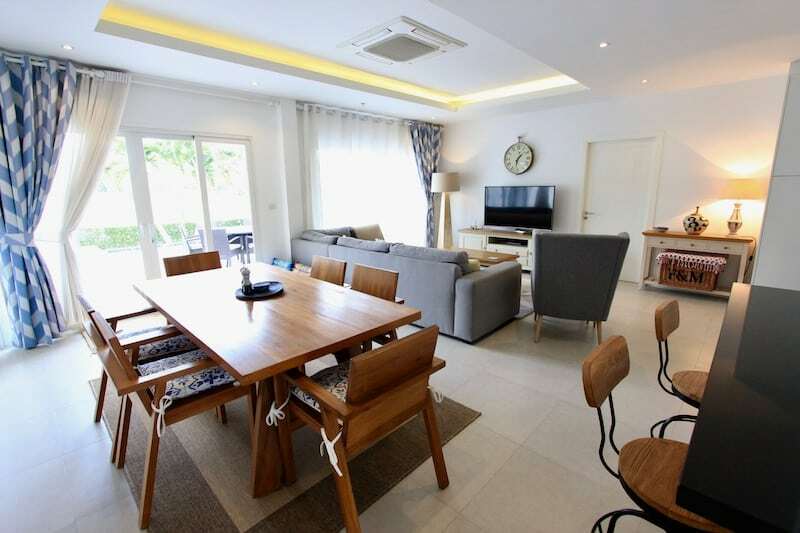 The location is very close to the Hua Hin International School, and approximately 10-15 minutes to downtown Hua Hin and to the beach. 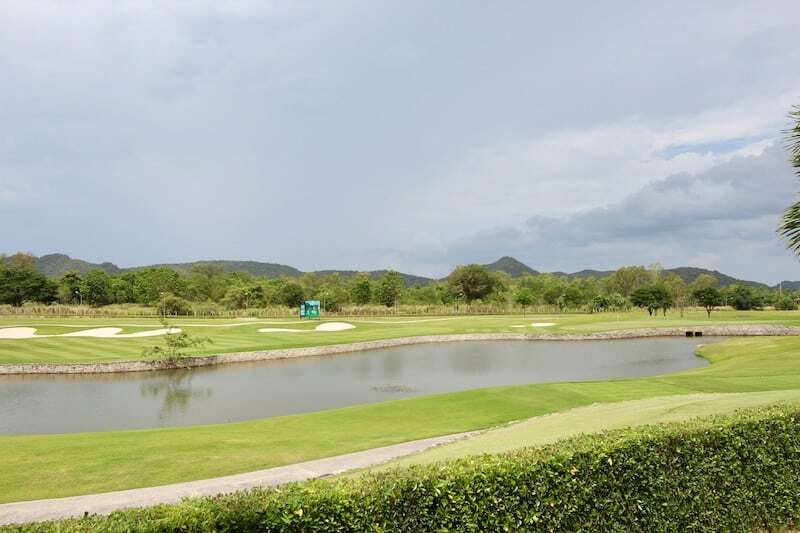 The golf course also has a full-service restaurant and bar, open for lunch and dinner every day; a beautiful spa and wellness center; and a water park and wake boarding park. 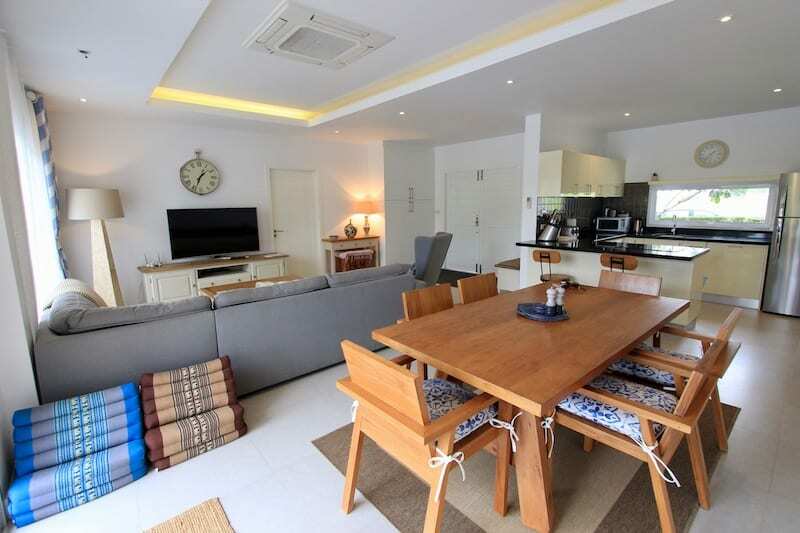 The bypass road is 5 minutes by car, and makes traveling back and forth to Bangkok much quicker and easier. 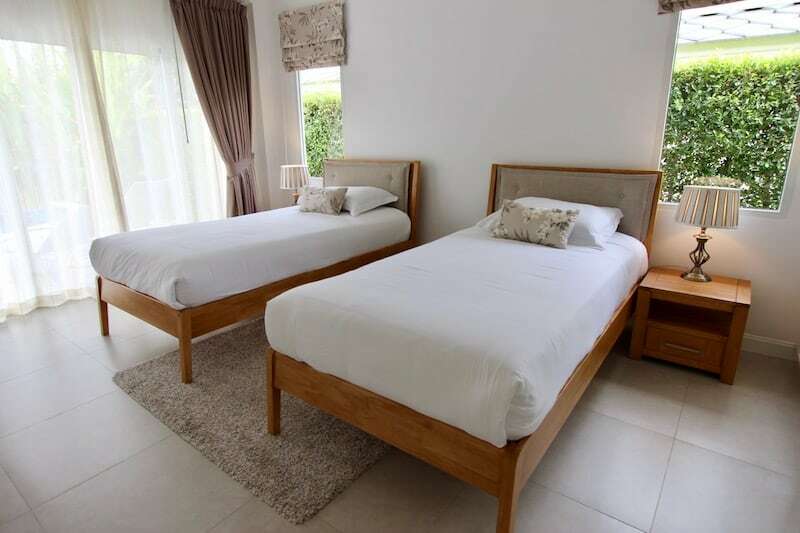 The property consists of an open plan living and dining room, beautifully furnished with high quality, comfortable furnishings; a fully equipped kitchen with high end appliances; 3 spacious bedrooms, each with its own en-suite bathroom; a private swimming pool and terrace, furnished with a lounge set, a dining table, a large sun umbrella, and a gas BBQ grill. 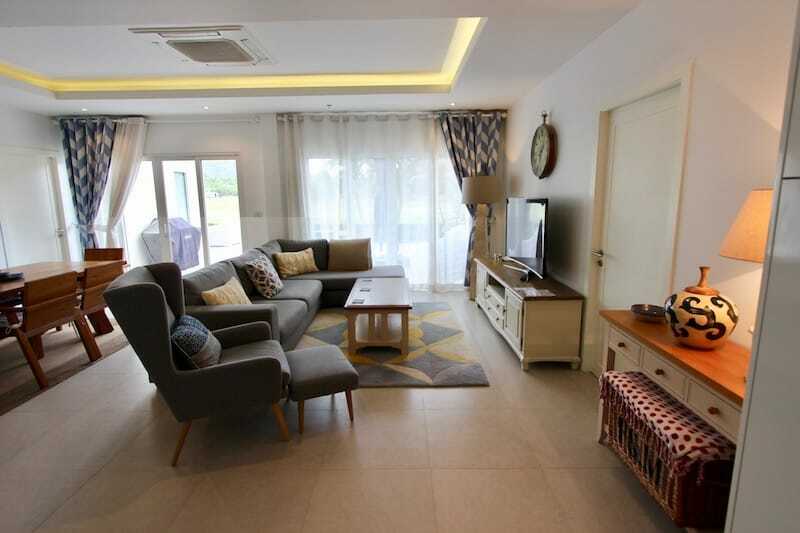 The living room includes a built-in storage closet, smart TV, wireless internet, recessed lighting, high quality curtains, and an L-shaped sofa and armchair. 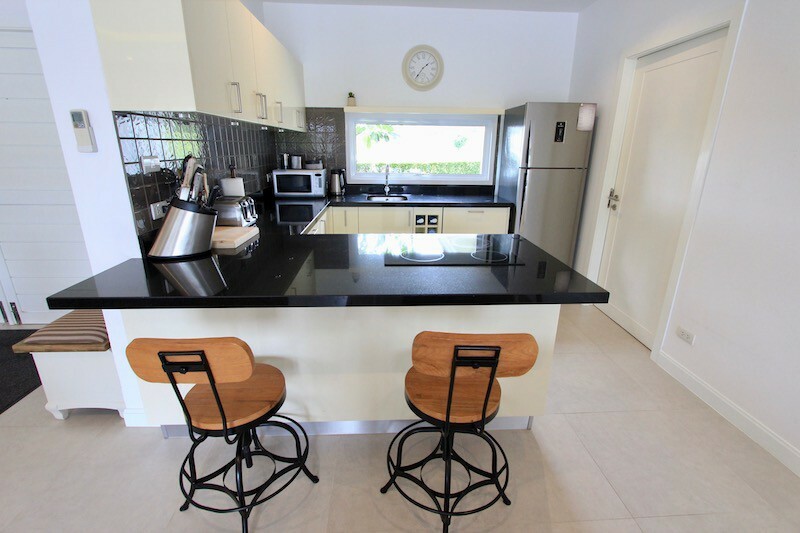 The kitchen has granite countertops, ample cabinet space, an oven, electric stove, a dishwasher, microwave, and all necessary small appliances. 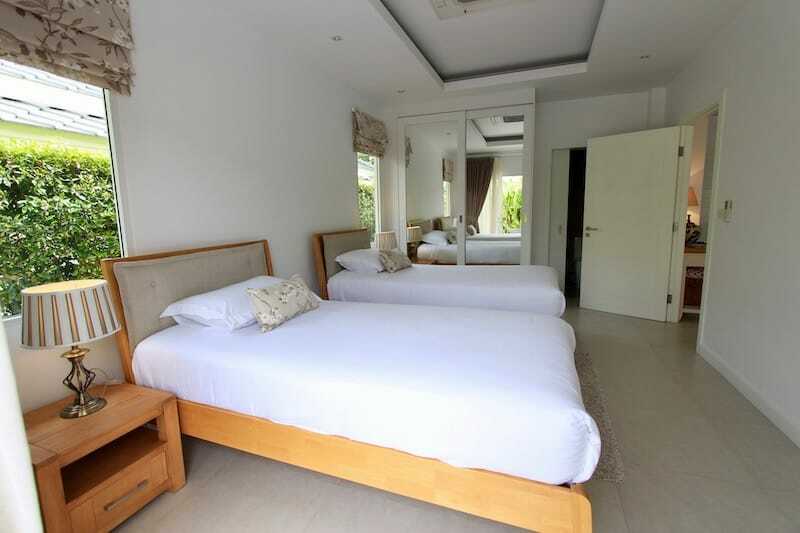 The master bedroom is very spacious with a king size bed, a desk and chair, and small sofa. 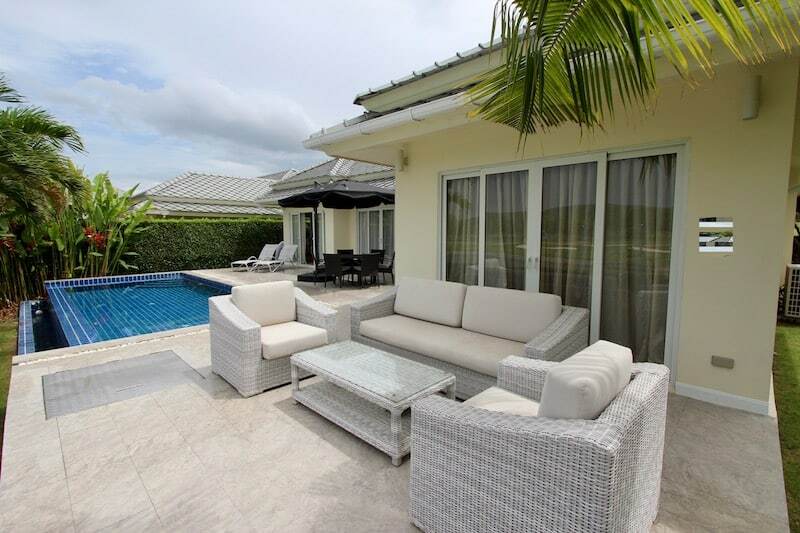 There is direct access via sliding glass doors to the terrace and pool area, and the master suite also includes a walk-in closet with vanity and ample closet space. 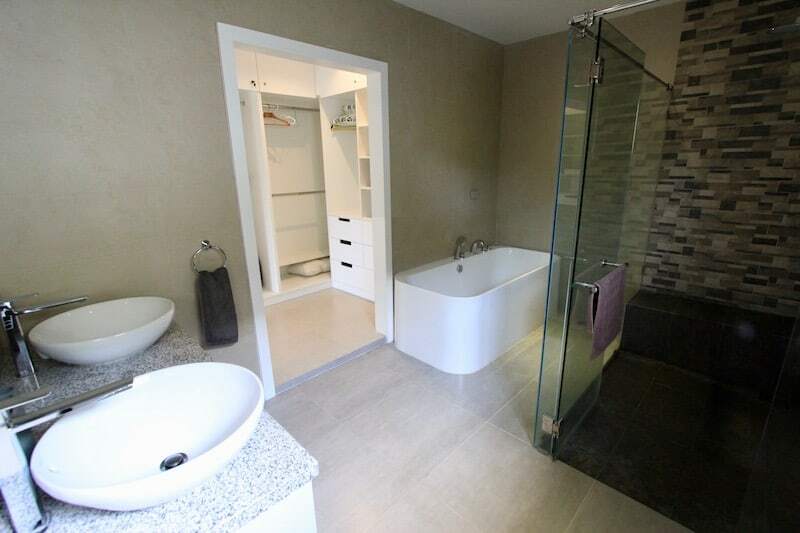 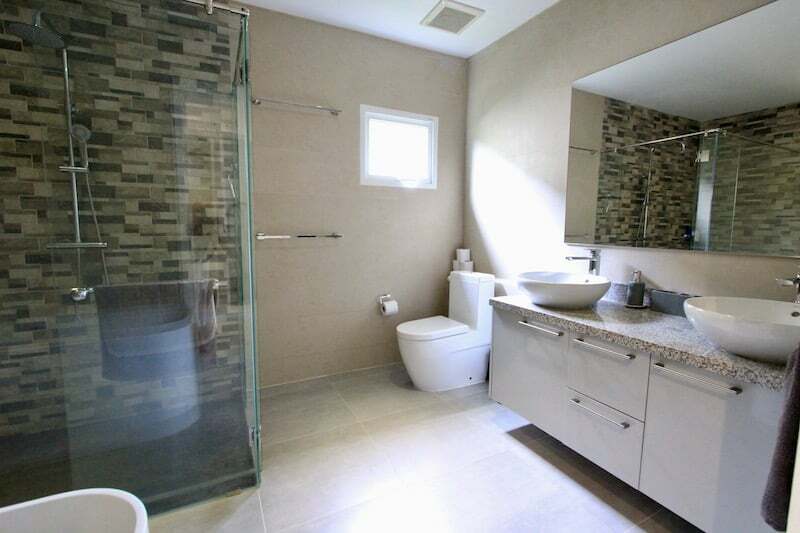 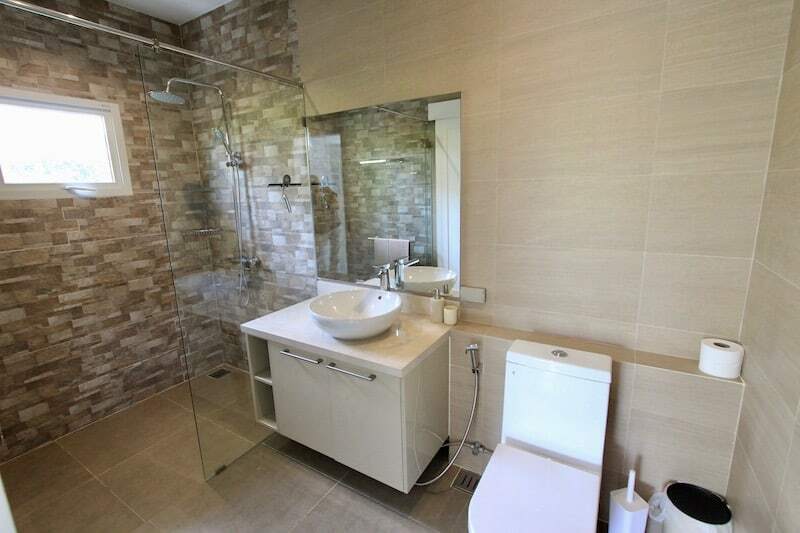 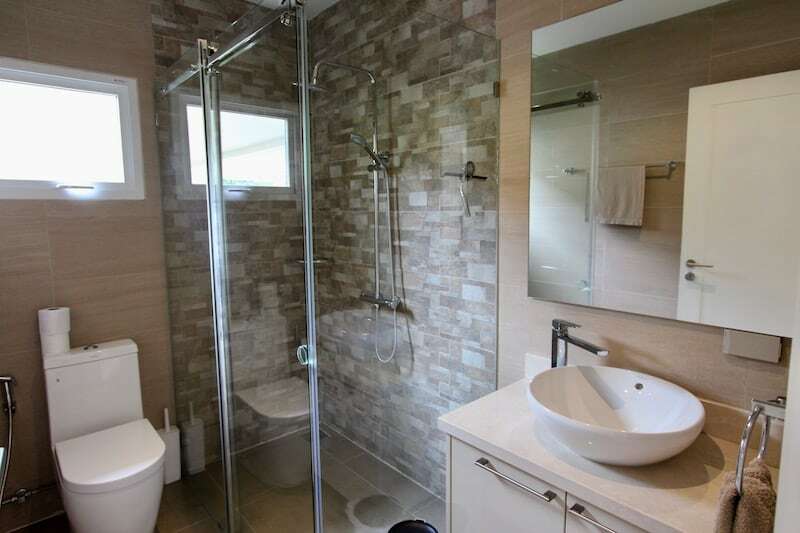 The master bathroom has double sinks, a walk-in shower and a beautiful, luxurious bathtub. 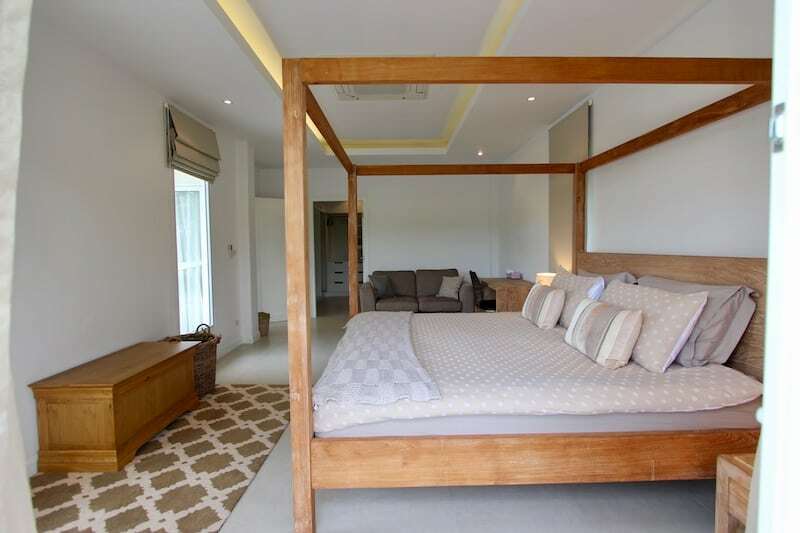 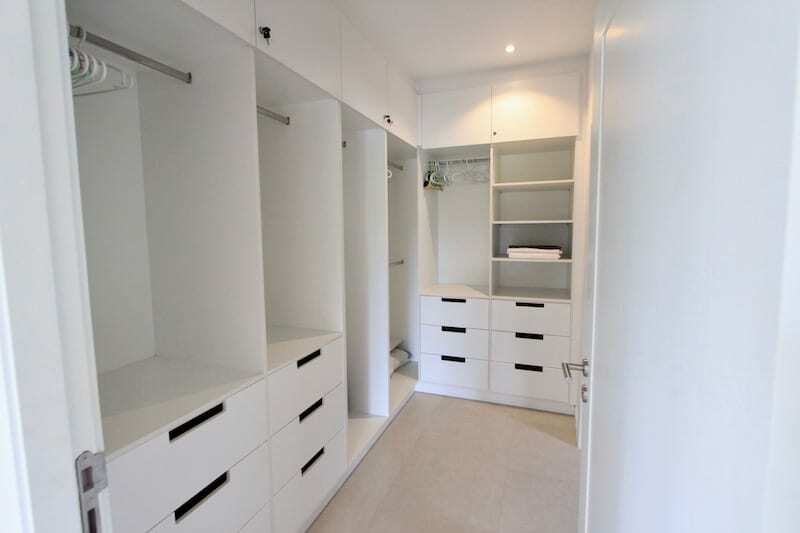 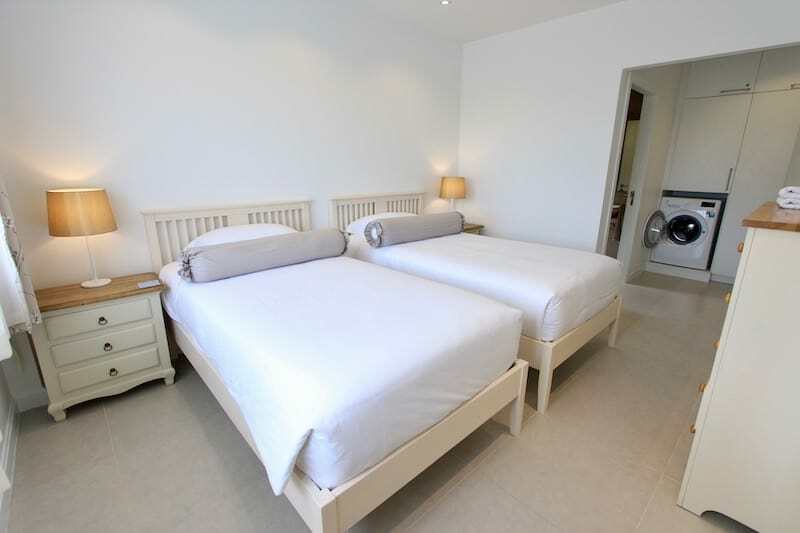 The 2 guest bedrooms each have 2 twin beds, built-in closets and full en-suite bathrooms. 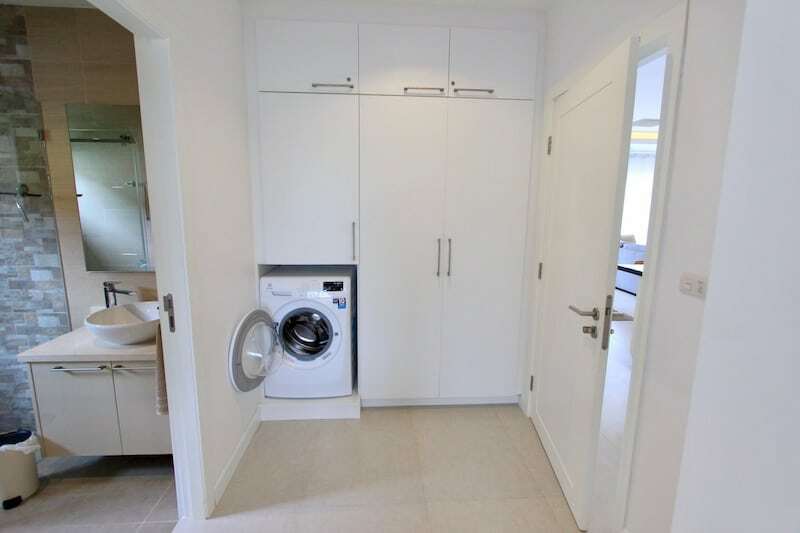 There is also a washing machine in one of the rooms. 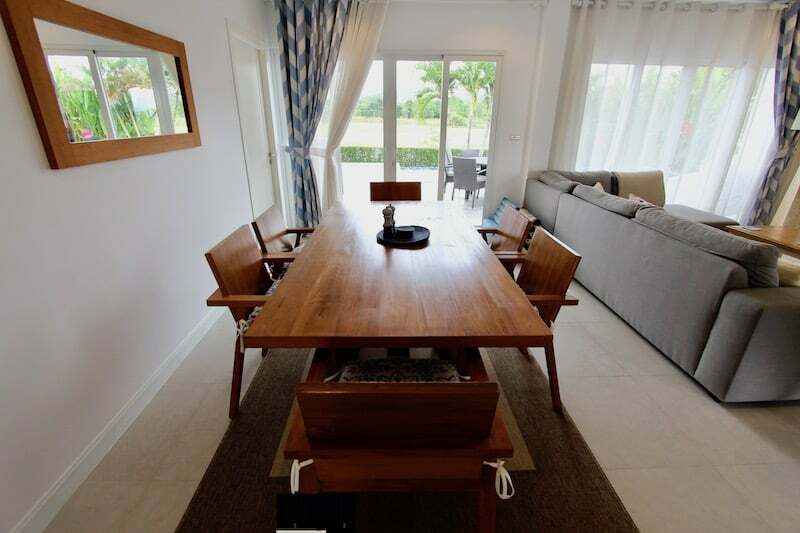 The property is surrounded by natural, green privacy walls, and the garden is lushly planted with tropical foliage. 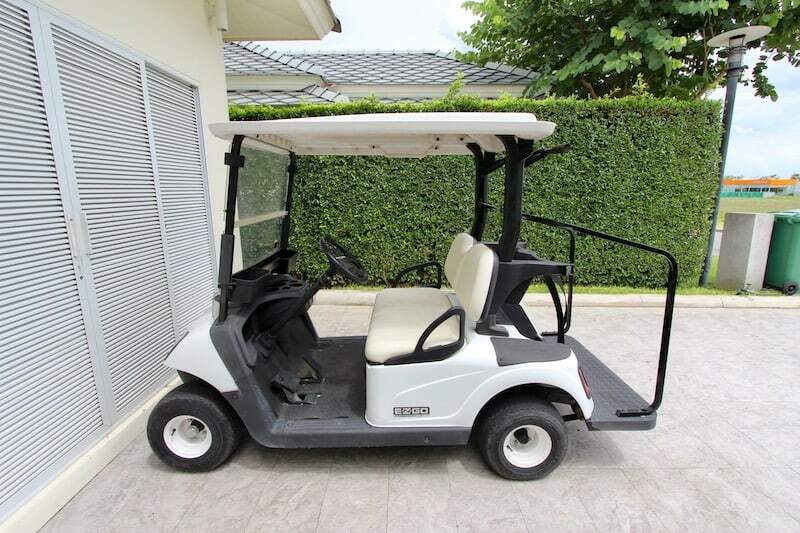 The home comes with a golf cart for your usage, and there is a carport with additional storage closet. 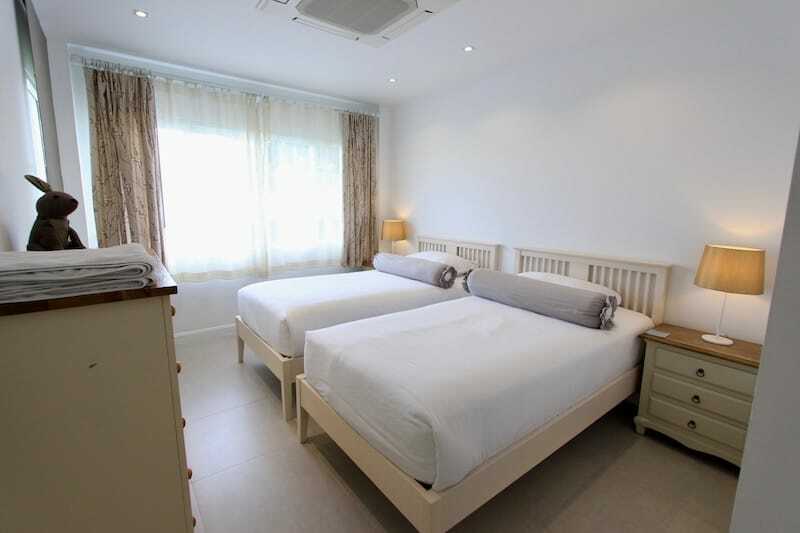 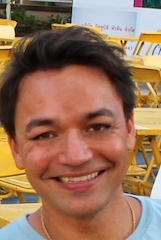 Long term rentals preferred. 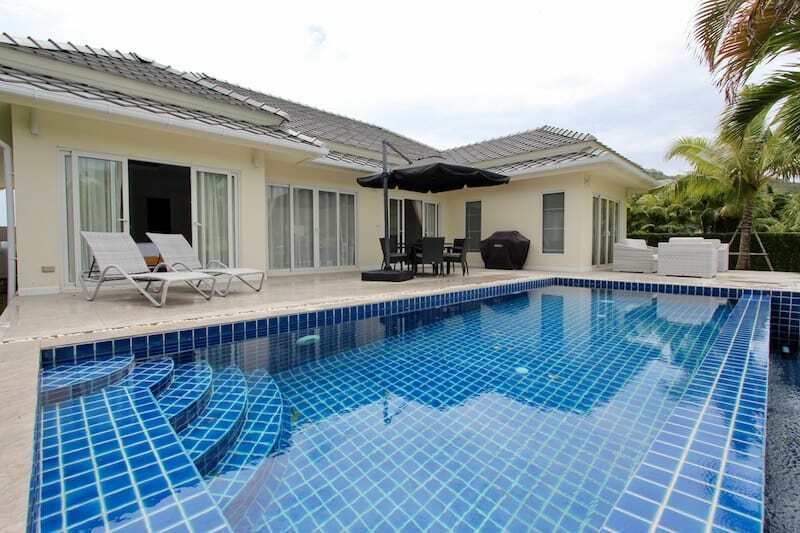 For more information and to arrange a viewing of this Hua Hin home for rent at Black Mountain, please contact Executive Homes Hua Hin at +66(0)85.264.2158.